Observations of this cluster component star colours was conducted by the “Double Star Section” of the Astronomical Society of New South Wales (ASNSW) during the early-1980s. Here some thirty-four observers went out to observe and visually examined ten selected bright stars of the Jewel Box. Colours they have observed appear in Table 2, whose assigned number corresponds to the Figure 7 above. (This is the same as the page with the star Individual Descriptions. Figure 8. 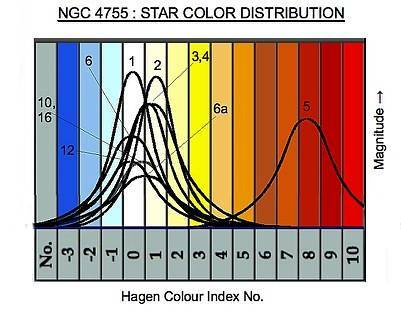 This shows the distribution of the observed star colours made by observers, and assumes a normal distribution. It clearly shows that individuals perceived visual star colours is diverse, reflecting the now common notion that most star colours are unreliable. There is also a rough correlation that fainter stars become more difficult in seeing colour. This graphic shows that all stars are white (tending yellowish) rather than the expectant blue — including Kappa Crucis. Only the 7.2 manitude central star in the middle of the bar is notably coloured orangey-red. Notably too, none of the observers saw any green or greenish colours as often reported in common observations made during the 19th Century.